"We want to show our foreign fans that, although the Chinese people are small in stature, we are good fighters..."-- Liu Chia Liang in Southern Screen, July 1977 page 30. THE 36 CHAMBERS OF SHAOLIN (1978) was essentially Master Liu's version of Chang Cheh's SHAOLIN TEMPLE (; it even included a brief expansive shot from that film showing the inside of the temple set). Easily one of the best movies of its kind to depict the actual training of Chinese kung fu, Liu again manages to weave some genuine pathos for his characters keeping them grounded in reality and overly sympathetic. This was in direct opposition to the adrenaline charged, testosterone fueled masculinity of Chang's pictures. Liu's magnum opus took 3 months to complete and employed upwards of 500 extras. All the hard work paid off handsomely, as the film was a huge success. The directors devotion to Chinese martial arts is embedded in virtually every frame. It's a brilliant movie from a brilliant director. Chang Cheh's massive Shaolin spectacle was episodic in structure detailing an array of characters and featuring many training sequences leading up to a 30 minute battle at the end. When Liu Chia Liang made 36TH CHAMBER, his film was equally sprawling, but put the central focus on a single character -- the historical monk, San Te essayed to perfection by Gordon Liu. 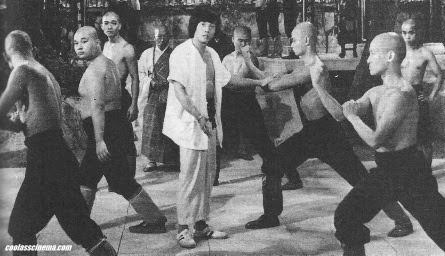 He magnified the amount of kung fu training sequences going into much greater detail than had been seen before. What was ingenious about this was that through the meticulous, and varied training methods (detailing how the monks became martial arts masters) San Te endures, the character is gradually built before our eyes. It's one of the most fascinating character arcs ever seen in a martial arts film. You're virtually watching a young boy grow up to be a man within a two hour time span. It's easy to see why this film is so well regarded today. 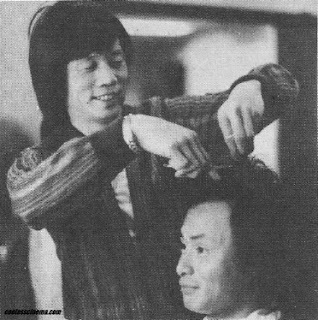 Master Liu cuts his adopted brothers hair for his iconic role. There were many great kung fu movies, and many great directors of kung fu movies. 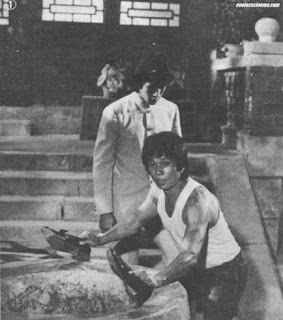 Liu Chia Liang was unique in that he was a martial artist making them. He was always interested in delivering top kung fu pictures for the domestic Asian markets. But now, he was recognized outside of Asian territories. His enormous success and accolades seemed to imbue the director with a desire to impress his foreign fans as well. Unfortunately, this all seemed to change by 1980. Still, there was much for the director to celebrate, and it was a great time to be Liu Chia Liang and his adopted brother, Gordon Liu. The youngest of the Liu/Lau family of fighters, Jimmy Liu is the nephew of Liu Chia Liang. He had a good look about him, but he never hit it big in movies. Some of the films he headlined were clones of whatever was popular at the time, while others were barrel scrapers of the highest order. His sole starring role for Shaw Brothers in the disastrous TIGRESS OF SHAOLIN (1979) is a superb example of the latter. And who could forget him being raped by a homosexual ghost in THE FEARLESS DUO (1978)? Even Hwang Jang Lee couldn't save that one. He did co-star in the Lau Brothers production, CARRY ON WISEGUY (1980) aka WARRIOR FROM SHAOLIN. Two other pictures he starred in -- CRAZY COUPLE and DRAGON'S CLAWS (both 1979) were run of the mill, but worth watching. The latter film benefits from a lead villain performance by Hwang Jang Lee. Jimmy Liu didn't confine his showbiz prowess solely in front of the camera. He also operated in other duties behind it, as well. Reportedly, he's still active today as a kung fu instructor. 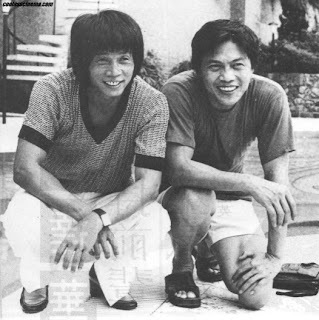 Sandwiched between two of the directors greatest movies was possibly his oddest, most divisive film for Shaw Brothers. 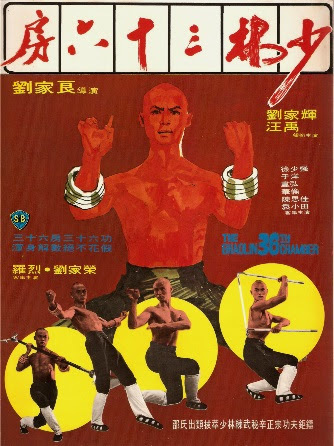 While equally subversive (particularly in its treatment of protagonist and antagonist) when compared to both his first movie, and HEROES OF THE EAST (which was also in production at the time), SHAOLIN MANTIS (1978) was an unusual blend of Liu's typical familial martial values mixed with a tragic plot line. The typical hero role is made complicated for this film clouding discernment as to whether he's actually a good guy or bad guy. The proposed hero is sent by the tyrannical Qing emperor to uncover a powerful family of government rebels. He manages to get close to the family to learn their secret, even marrying the daughter in the process! It sets up a bewildering arc that confuses the audience on how they should feel regarding the lead character. It's both a unique plot contrivance, and also the films greatest detriment. Liberties are also taken in the creation of the Mantis style. It's simply a bizarre movie all around, but a rather daring experiment for the esteemed director. Whatever ones opinion of SHAOLIN MANTIS, there's no denying that Master Liu made David Chiang (he's known as John Chiang nowadays) look the best he'd ever looked in a kung fu movie (he was also impressive in THE CHALLENGER  and THE LOOT ). Earlier in the decade, David was known as the 'Movie King' at Shaw's for his popularity with fans and the number of box office hits he was attached to. He was believable in swordplay films, but his hand-to-hand failed to convince at times. Liu made him look good. 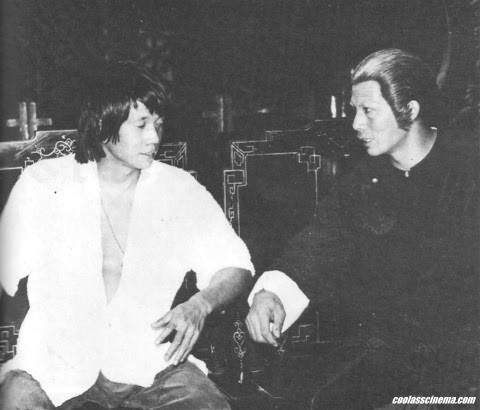 Chiang got a second wind at this point in his career, and headlined a slew of kung fu movies in the late 1970s and into the early 1980s. Gordon Liu has a guest star turn at the opening of SHAOLIN MANTIS playing a bald shaolin monk ordered to fight Chiang's character in a duel. Speaking of Gordon Liu, his bald head became such an iconic image, that to see him in a movie sporting a head full of hair seemed downright bizarre. And seeing him with hair in his next movie is at first odd, but it's such a great film, you soon separate the familiarity of San Te from Gordon Liu. Master Liu continued his own brand of innovation with his next project, HEROES OF THE EAST (1978). Working with the tentative title of 'The Heroic Chinese', Liu's next film was essentially the polar opposite of all the blood and viscera strewn 'Chinese vs. Japanese' fist and kick flicks that dominated the early part of the 1970s. Liu's film trades violence and generous splashes of red for a battle of the sexes that leads to a serious misunderstanding between the two cultures. 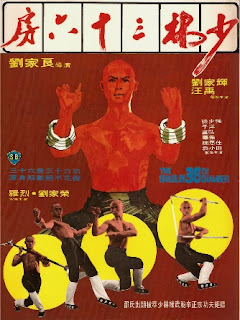 What follows is a series of intricate duels wherein Gordon Liu takes on a new Japanese villain each with their own varied style of martial art. Peppered with highlights, the Shaw's were apparently confident they had another hit on their hands as HEROES OF THE EAST was heavily promoted in their magazine publications. The Japanese heavy cast was ballyhooed to a great degree, most especially the participation of Yasuaki Kurata and the gorgeous model, Yuka Mizuno. In the end, Liu had outdone himself yet again with this subversive take on a familiar storyline packed with incredible, ingenious fighting sequences. It's all the more amazing in that nobody dies. Chang Cheh, and Shaw Brothers movies in general were renowned for their countless, gory martial arts movies. 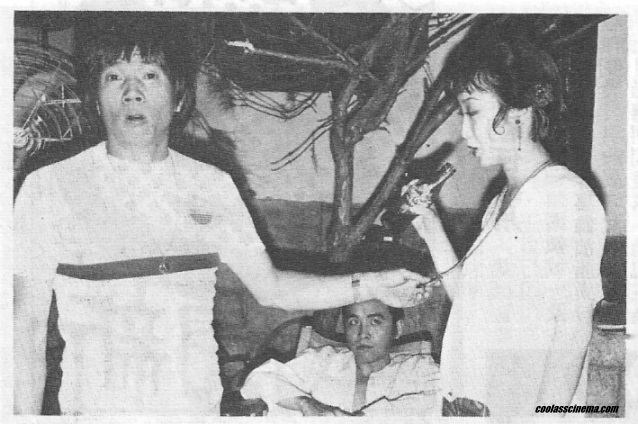 Unlike most directors, Liu Chia Liang focused more attention to family and tradition than to blood and guts. From here on out, Liu Chia Liang's movie career would be dominated by kung fu pictures saturated with increasingly grating comedy shenanigans. The films themselves were a delight in the intricacies of the fight sequences, but often the heavy-handed humor made for a difficult viewing experience at times. Save for one motion picture, all of Liu's Shaw movies from this point on would contain a thick aura of comedy, or operate as kid friendly entertainment. 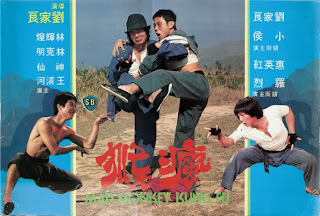 This was readily apparent in Liu's next two movies -- DIRTY HO and MAD MONKEY KUNG FU (both 1979). The humor is concentrated in the former -- born out of certain characters parcel to some jarringly bizarre battles; but it points towards the sort of extreme silliness Liu's movies were angling for in subsequent pictures. The latter is non-stop action laced with near constant goofiness. The English title of DIRTY HO refers to the conman character played by Wong Yu. The plot is somewhat complicated, if cynical in execution. Essentially, it's the tale of the 11th Prince covertly mingling amongst commoners while manipulating a petty thief to help eliminate a string of assassins hired by 4th Prince, Frankie Wei Hung to keep him from ascending the throne. The final scene, while humorous, is pessimistic as the prince discards Ho after he's served his purpose; much like you would a piece of garbage. The 11th Prince basically wants his cake and eat it, too. Slaves aren't to question, but only do, and that's how Gordon Liu's character shows himself to be come the finale. DIRTY HO features some of the directors most creative choreography; most particularly in the 'congenial duels' found throughout -- a number of fights take place while hidden under the guise of a friendly conversation. For example, everyone else is oblivious to the fact that two men are trying to kill each other while sharing their love for art! Both here and in MAD MONKEY KUNG FU, Master Liu devises creative fighting sequences that are enhanced by the artfully designed Shaw sets. MAD MONKEY KUNG FU is a particularly irritating movie, but the fights save it, and that's really all it has going for it. Liu Chia Liang not only directed and designed the plethora of action, but he took the lead role, as well. Master Liu often took small roles in his films, but this was the first time he'd taken the lead. 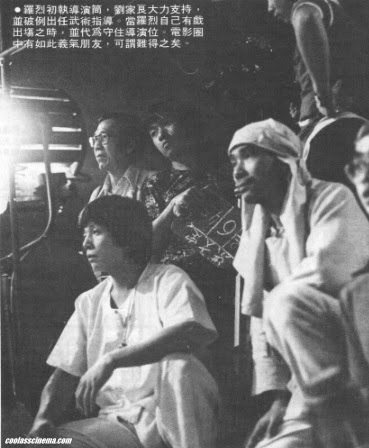 His student, Hsiao Hou, co-stars (see above photo), but he fails to be a memorable presence despite being an incredible acrobat and kung fu performer. The film is very popular among fans, and it probably has the most action of all the films on the directors resume. Reportedly spotted by a Shaw talent scout, Kara Hui Ying Hung was a nightclub dancer before Chang Cheh put her in a few of his movies including THE BRAVE ARCHER (1977) and INVINCIBLE SHAOLIN (1978). She signed with the company in February of 1975. Other early roles include an assaulted teen in Kuei Chi-Hung's nasty CRIMINALS 5: TEENAGERS NIGHTMARE (1977) and came to a tragic end in Wang Feng's obscure THE LAST JUDGMENT (1979). Having learned martial arts from her sisters prior to appearing in movies, she didn't get a chance to do much in the way of fighting till her co-starring role in the awful THE TIGRESS OF SHAOLIN (1979). From 1981 onward, she got many fighting roles, most famously in the works of Liu Chia Liang. She won a Best Actress award for her role in MY YOUNG AUNTIE (1981) aka THE ELDER. She was also alleged to have been romantically involved with Liu. Her brother was the late Austin Wai Tin Chi. Kara has had one of the longest careers of any HK movie actress, and still appears in motion pictures today. 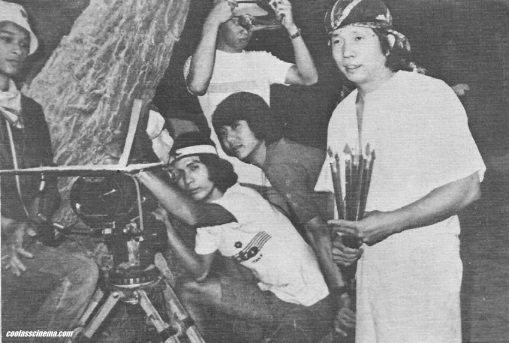 In 1979, Lo Lieh was given an opportunity to fulfill his dream of directing a film solely of his own. That particular movie was CLAN OF THE WHITE LOTUS (1980). 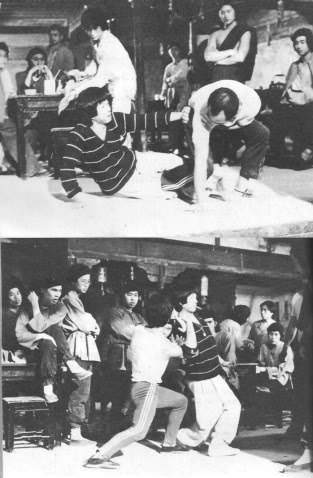 Operating as something of a sequel/remake of Liu Chia Liang's EXECUTIONERS FROM SHAOLIN (1977), the revered Master Liu helped out his friend by choreographing all the marvelous fight scenes. Lo Lieh even played the White Lotus of the title -- the superior colleague of the now dead White Brow Priest, Pai Mei. 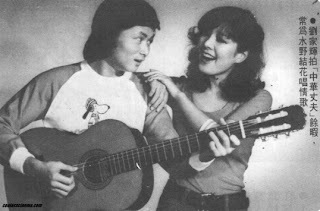 The team-up of Lo and Liu (see insert photo) was a much ballyhooed event at the time. Sometime around the completion of MAD MONKEY KUNG FU (1979), Liu's temperament changed. Despite his wealth (he had an affinity for fancy cars) and popularity, Master Liu became disenchanted with the company. As relayed to Chang Cheh by Sir Run Run Shaw himself, Liu was not "someone for long-term partnerships." His sense of pride and ego seemingly got the best of him at times. 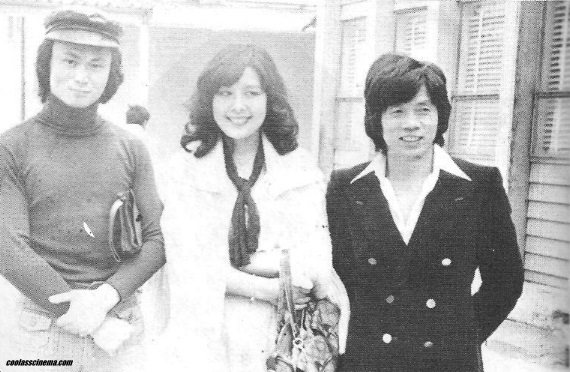 His relationship had soured with Chang Cheh in 1975, and a few years later, the same had happened between him and the Shaw's. Whereas at one time he seemed eager for international appeal, he had now changed that sentiment, too. Still, he remained constant in always displaying traditional Chinese martial arts onscreen with superlative choreography. Liu left the company briefly to work with his brother on a few independent films under the Lau Brothers Film Company banner. Liu didn't direct any of these, only designed the action sequences. Reportedly, Liu was an avid gambler on horse races, but luck wasn't on his side when it came to making independent movies. He eventually returned to Shaw's, and to familiar territory, with RETURN TO THE 36TH CHAMBER and MY YOUNG AUNTIE. 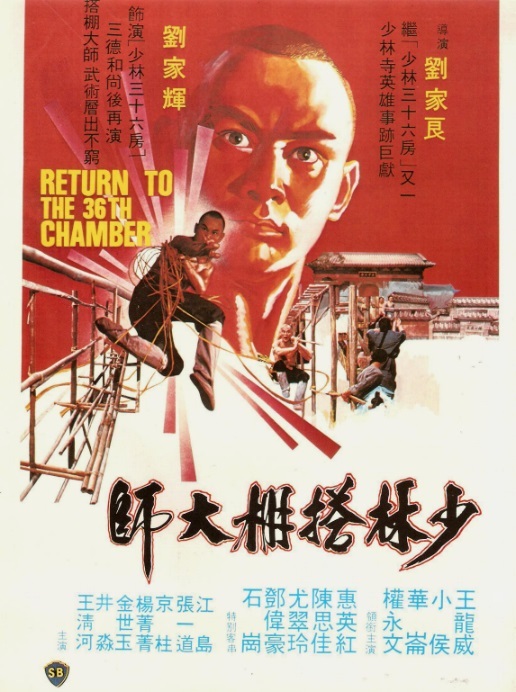 The Shaw's, obviously excited about the potential of Liu's 36TH CHAMBER sequel, entered the picture at Cannes; but Liu was reportedly not interested in this sort of exposure. 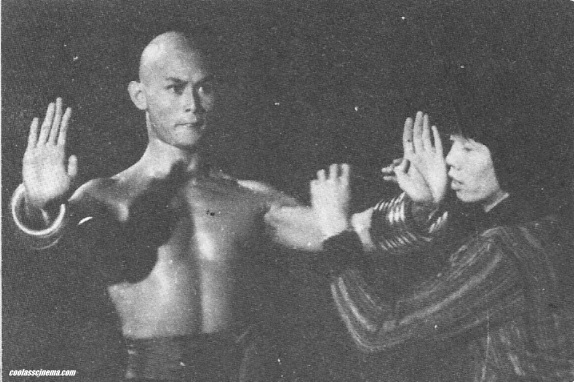 It's worth noting that Liu Chia Liang took a huge gamble with RETURN by having Gordon Liu play an entirely different character the second go round. MY YOUNG AUNTIE (1981) is arguably the more interesting of the two; mostly in the way the director bridges the generation gap while presenting Western influence on Eastern culture. Some fans dislike Fu Sheng for his impish antics, but Liu Chia Liang lets his disciple Hsiao Hou run wild seemingly every time. He's a marvel to watch onscreen, but too often he appears to suffer from ADD. Both films are incredibly silly, and despite being suitable for the entire family (nobody dies in these two, either), the oppressive, forced humor may be too much for some viewers to take. Overly exaggerated comedy was a staple of Liu's movies beginning in 1980. Even predominantly serious films like LEGENDARY WEAPONS OF CHINA (1982) wasn't immune to irksome humor (not to mention some scenes being backed by annoyingly shrill music). 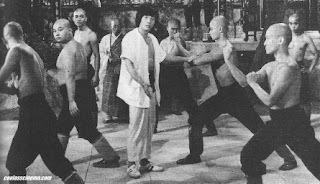 However, the fight sequences remained incredible, and both those pictures (RETURN and AUNTIE) benefited from supporting villain roles from Chuan Yung-wen aka Kwan Young Moon; a Korean Taekwondo expert familiar to kung fu movie fans. The silliness continued with 'The Gyms'; or MARTIAL CLUB as it was known upon its theatrical release in 1981. This was Master Liu's favorite of his films (previously it was HEROES OF THE EAST), and considering his upbringing and early career pre-Shaw's, it's not hard to understand why. MARTIAL CLUB contains some of the directors best work, and it's obvious the subject of a young Wong Fei-hung amidst rival gyms was close to the directors heart. Master Liu tinkered with cinematic tropes once more -- this time in having perennial villain, Wang Lung Wei play a good guy! The film is one of the best kung fu films ever made, and while the comedy is prolific, it's not nearly as abrasive as it is in some of the directors other productions. Strangely enough, it was titled INSTRUCTORS OF DEATH on these shores despite nobody dying in the movie. It was around this time that the troubled actor, Alexander Fu Sheng would star alongside his brother, Chang Chan Peng, in Liu Chia Yung's hilarious THE TREASURE HUNTERS (1981). He would also become a pupil of Liu Chia Liang, and star in a few of his movies. This meant there were more overwrought comedy scenarios coming, but also some true kung fu classics. An example of the latter began shooting in May of 1981 as 'The Heroic Family'. With virtually zero humor, it was to be the directors most serious, gloomy work yet; and ultimately proved so in more ways than one.